Known as the "god of manga" and the "father of anime," Tezuka Osamu (1928 - 1989) has created hundreds of comics, dozens of films, and even some television series (including such internationally beloved shows as "Astro Boy" and "Kimba the White Lion.") His pioneering, unparalleled career is without rival for its extraordinary range of visual styles. Included in this set are some of Osamu's most legendary works, including Pictures at an Exhibition and Legend of the Forest. The former combines 10 individual short vignettes to create stunning visual riffs on classic fine art. 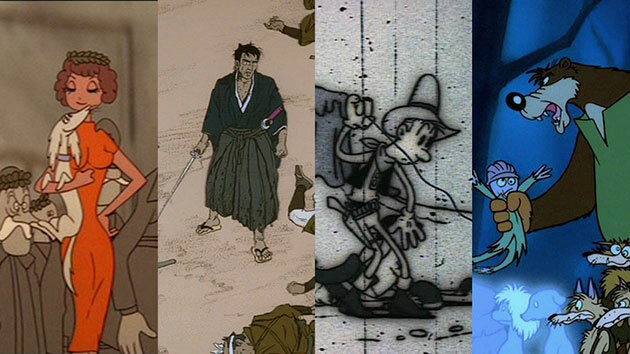 But the 30-minute Legend of the Forest is the animator's masterpiece. An epic of forest faeries, sprites, wizards, and animals defending themselves against greedy industrialists bent on destroying nature, the film stylistically traces the evolution of animation from 19th-century etchings, to Disney and Fleischer cartoons, to contemporary anime. The animation in Legend of the Forest is as ravishing and inventive as anything seen in Disney's Fantasia. Kimstim is proud to release this astonishingly imaginative collection of Osamu's 13 most innovative pieces, many of which are the master's own personal favorites.